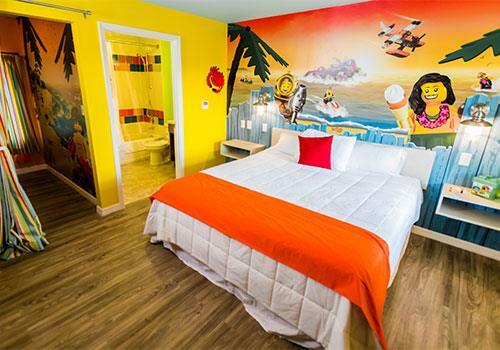 Situated adjacent to LEGOLAND® Florida, this beach-themed oasis provides a village-style layout with 83 bungalows and 166 guestrooms sectioned out into 13 whimsical sections, each named after a popular LEGO Minifigure. Amenities include a full buffet breakfast, an abundance of pool and water activities, complimentary WiFi, and picture-perfect views of Lake Dexter. Each group of bungalows includes an outdoor play area for kids. Full breakfast buffet is included in your stay. Features 13 LEGO Minifigure themed sections of the property. Bungalows sleep up to five and include an outdoor patio and a separate children’s sleeping area. 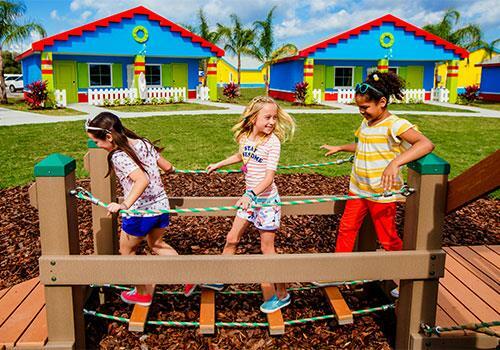 LEGOLAND® Beach Retreat features a village-style layout with 83 beach-themed bungalows offering 166 separate rooms, each with whimsical LEGO® décor inside and out. 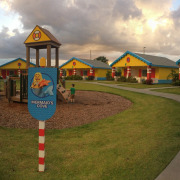 The brightly colored bungalows are grouped into 13 sections, each named after a popular LEGO Minifigure including Shark Suit Guy, Ocean King, and Sea Captain. Each section centers around an outdoor play area with fun and challenging elements, all within view of the bungalows’ shaded patios, where parents can put their feet up, kick back, and relax while kids play. 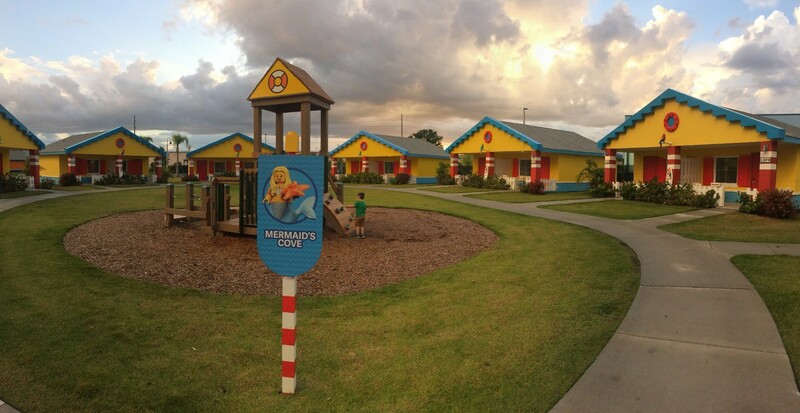 Conveniently located adjacent to the popular Theme Park, LEGOLAND Beach Retreat combines the fun of surf and sand with the creativity of LEGO building sets and will offer picturesque views of Lake Dexter from nearly every sun-kissed corner. 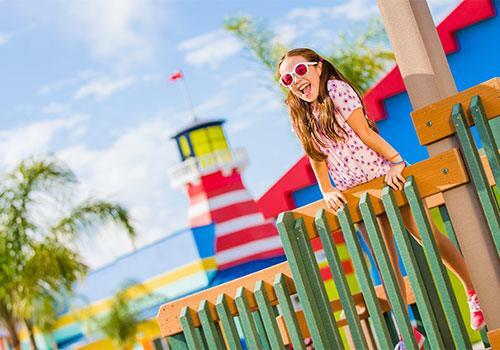 All guests enjoy a full hot breakfast buffet at Sandy's Castle Restaurant, and complimentary scheduled shuttle service is provided to/from LEGOLAND Florida park. How many rooms are at the property? 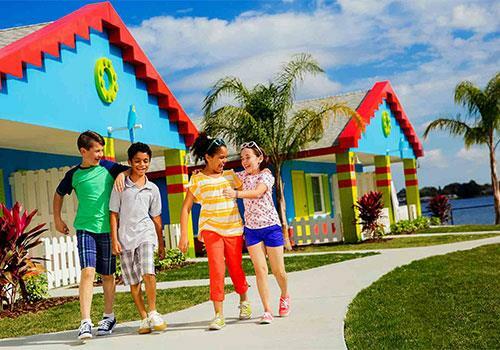 LEGOLAND® Beach Retreat has 83 bungalows divided into 13 LEGO themed sections. 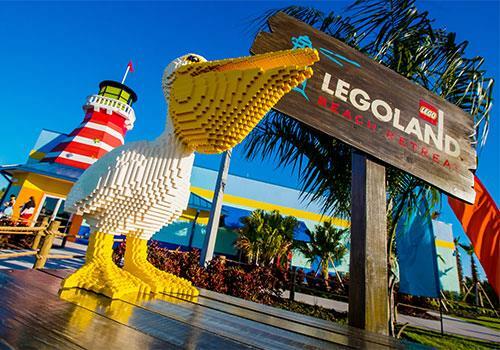 How far is LEGOLAND® Beach Retreat from the theme park? The resort is ½ a mile from the theme park. Does the hotel offer a shuttle to the theme park? Yes. 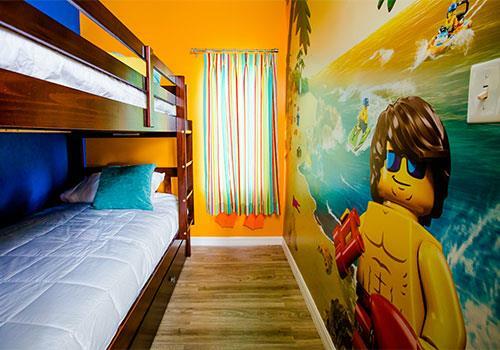 LEGOLAND® Beach Retreat is located approximately 1/2 of a mile to the Theme Park. A free shuttle bus is available to and from the Theme Park entrance from 8:45 am to one hour after the Park closes. Yes. A full buffet breakfast at Sandy’s Castle Restaurant is included in your stay. Yes. There are ample parking spaces available for guests. Only service animals are permitted into the bungalows and hotel property. No. This is a 100% smoke-free property. Am I required to pay a resort fee? Yes, a $20 nightly resort fee is applied and collected at the time of reservation. This resort fee includes standard parking, Wi-Fi access, local calls, access to the swimming pool and pool towels. Will my bungalow have an in-room safe? No. The room size does not allow for an additional bed.